The AORUS K7s strongest suit has to be the Cherry MX reds, we were highly impressed by their performance when it came time to get some serious gaming done. They were fast, responsive and fluid - which are all highly sort after attributes that make them great for all types of games. Aesthetically the K7 is an attractive keyboard, with its brushed metal fascia and very classy copper outlining trim, the only thing that does detract from its appearance is the RGB. The illumination is the not the best we’ve come across, and we found that it was lacking vibrancy and accurate colours. This is unfortunately not the only problematic area as the AORUS Engine software fails to compete with most other software suites that are currently available and we also had some issues with the feel of the included keycaps. The K7 does claw back some points with the amount of bundled accessories that are included in the box. The best accessories are the replacement keycaps - which feel similar in quality to the stock ones, the keycap puller and included carry bag. However nice these additions are, it's not likely going to be the deciding factor when considering purchasing the K7 as they only help sweeten the deal rather than make it a must buy. Ultimately the GIGABYTE AORUS K7 performed superbly for gaming, unfortunately, this performance was slightly dampened by the weak software experience, poor RGB illumination and cheap feeling keycaps. 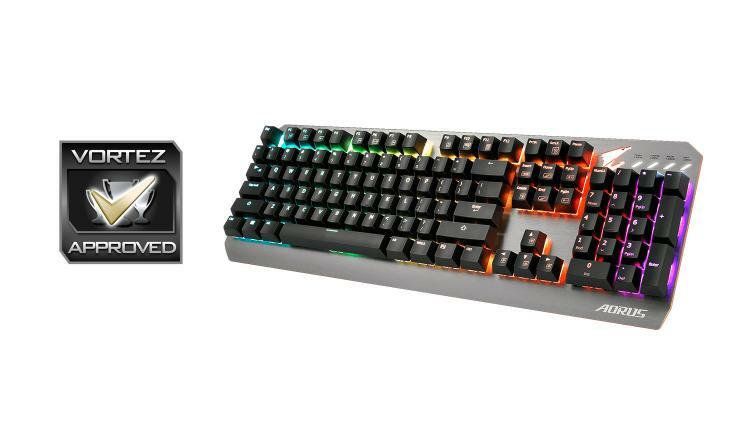 However, given its price point, we understand that some corners have to be cut in order to make use of the higher tier Cherry switches, so with that in mind, the AORUS K7s price of £80 ($109) is quite reasonable. For gaming, the GIGABYTE AORUS K7 hits hard; as a whole package, it struggles to match the impact of the gaming performance.